Tucked away in a residential suburb north of Great Yarmouth, a husband and wife team are producing some of the best tastes ever bottled. 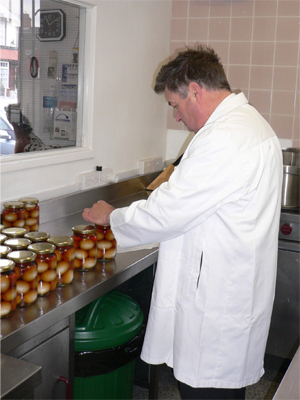 Norfolk Preserves is a family business run from a small shop at Hamilton Road, just off Caister Road. David trained as an electronics engineer but seventeen years ago, a hobby of making different sauces and experimenting with various tastes grew into Norfolk Preserves, when he produced his first commercial batch of marmalade with brandy. This marmalde is produced with the whole fruit which makes it thick and extra orangey compared to conventional marmalades which tend to be a sugary syrup with a few strands of peel. All jams and marmalades have 70 grams per hundred fruit content, and 50 grams per hundred sugar content. Fresh produce includes seasonal range changes and new lines are constantly being added. Locally-grown ingredients are used wherever possible, although there are some necessary exceptions: Balsamic vinegar has to be specially imported, Dijon mustard comes from Dijon. Keen local growers have even been known to bring along their own fruit to make up a batch for preserving or bottling.